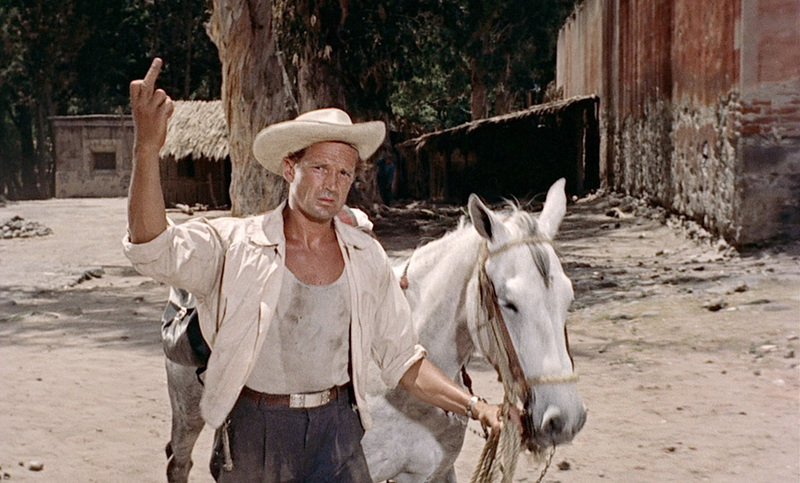 A 50s Latin America-set adventure tale directed by Luis Buñuel? You'd better believe it, and almost nothing about DEATH IN THE GARDEN [LA MOST EN CE JARDIN] plays to genre expectations. Long-time Buñuel fan Slarek discovers the film for the first time on a new Masters of Cinema Blu-ray, and loves it. At a gold mining camp in an unspecified South American country, soldiers roll up and inform the prospectors that their claims are being seized by the military government and that they will all be required to decamp and move on immediately. This does not sit well with the prospectors, who decide to take their complaints to the local commander, Captain Ferrero (Jorge Martinez de Hoyos), who has his soldiers meet their protests with rifles and warning shots. As the protestors scatter, surly adventurer Chark (Georges Marchal) wanders into town looking for a room for the night and is directed to the residence of local prostitute Djin (an alluring Simone Signoret). She's out when he arrives so he climbs in through a window and beds down for the night. When Djin arrives home, she is surprisingly unfazed and accepts Chark's offered payment, then the following morning turns him in to the military authorities. The disgruntled prospectors, meanwhile, hijack a military lorry and kill one of the soldiers, then suffer casualties of their own when reinforcements arrive. Chark busts out of jail, and when the soldiers publicly execute his mortally injured cellmate, it sparks an uprising, which Chark joins and enflames by blowing up the local armoury. When the revolt is suppressed, the military begin actively searching for Chark and the older Castin (Charles Vanel), who has been wrongly identified as one of the chief instigators of the riot but spent much of it having a head wound treated by Djin, whom he has plans to marry. To escape their pursuers, Chark and Castin flee aboard a riverboat captained by the double-dealing Chenco (Tito Junco), accompanied by Djin, Castin's deaf teenage daughter Maria (Michèle Girardon), and local missionary Father Lizzardi (Michel Piccoli). 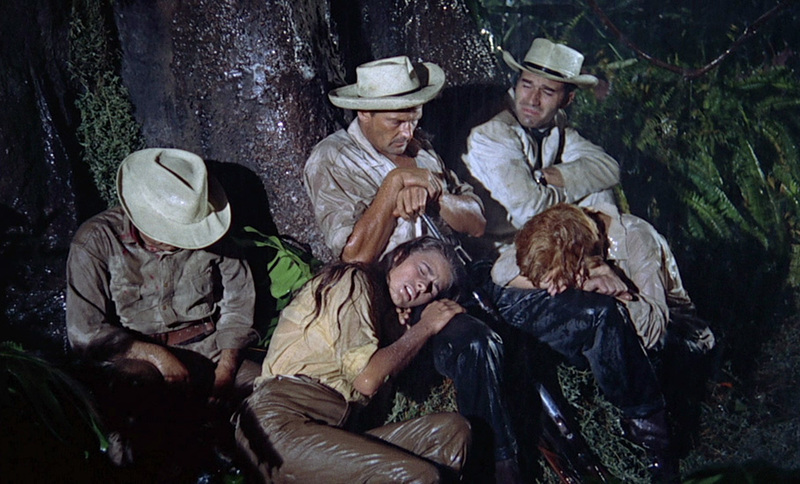 With the military in speedy pursuit, the escapees abandon their boat and head off into the depths of the jungle on foot, where torrential rainfall and a lack of food forces these disparate and argumentative individuals to work together in an attempt to survive. Forgive me for trivialising, but at first glance this does read a little like the plot for an energetic American potboiler from the 1940s. If you only had the above to go on, you could probably paint a picture of Chark as a loveable rogue (Clarke Gable would be perfect casting here), of Djin as the proverbial whore with a heart of gold, and Lizzardi as the group's upstanding guardian of morality. 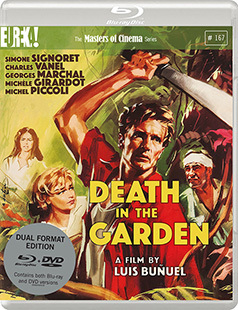 But Death in the Garden is not an American B-movie from the 40s, but a Mexican-French co-production from 1956 directed by Luis Buñuel. 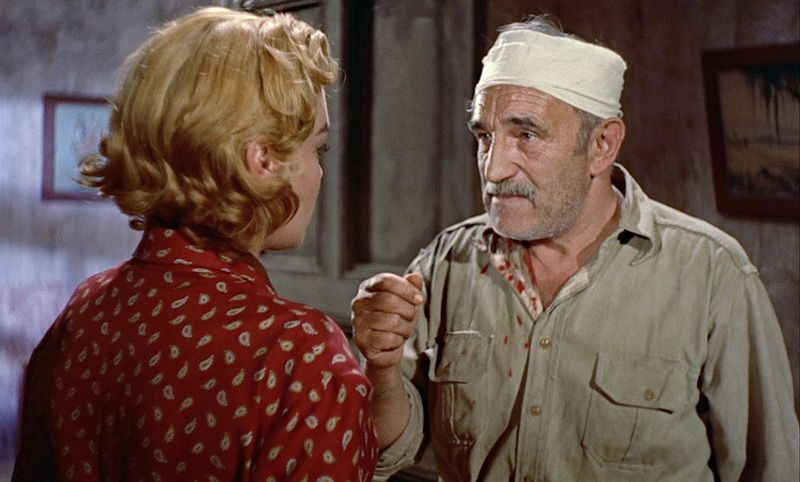 Yes, that Luis Buñuel (could there seriously be another?). It's a late work from his Mexican period, made six years after the brilliant social realism of Los Olvidados and three years before Viridiana began an extraordinary run of films that effectively defined the Buñuel we came to know and love. Even before you start digging for what we might call Buñuelian elements (and you won't have to look far), his approach to storytelling and character seriously messes with my pat predictions about how things would shape up were this a Hollywood adventure tale. First up we have Chark, who quickly proves to be far from a Gable-esque rascal, first signalled when he ambles into a potential line of fire during the first confrontation between the military and the prospectors and responds to one soldier's angry shouts by curtly flipping him the finger. I genuinely wasn't aware that this particular gesture of defiant insult had been around that long (research suggests it's actually considerably older). He heads straight to a bar, where he amuses himself by tormenting the innocent Maria, and when her father intervenes, he twists his arm behind his back and slams him up against the wall. He's curt and abusive to just about everyone, and having taken control of the boat by force, takes his revenge on Djin for her earlier betrayal by beating her mercilessly with his fist. What a guy. 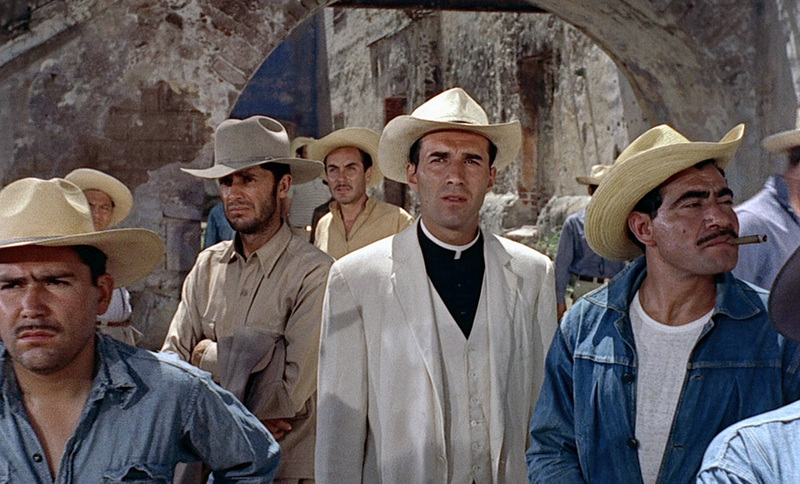 Buñuel's fascination with and contempt for religion, meanwhile, is given playful voice in the form of Father Lizzardi, an irritatingly ball of piety who happily takes gifts from big corporations and whose habit of seeing the downside of everything does not exactly endear him to the prospectors, who dismiss his warnings and mock his sermonising ("Those who live by the sword, die by the sword," he tells these would-be revolutionaries, who cheerfully respond, "So it's threats now?" and whistle him on his way). In a more direct rejection of everything he stands for, his attempts to comfort a dying prisoner are thrown back in his face: "I ask nothing of you," Lizzari tells the man, "except one word of repentance, and I shall lead you to God," to which the man responds sharply, "Piss off!" This is a community of gold diggers in more than just the literal sense, most clearly evident in Djin's mercenary willingness to exploit any situation that will allow her to turn a buck. It may seem obvious to us that she has no intention of marrying the delusional Castin and opening a little restaurant by the French seaside with him, but her tune soon changes when she learns that he has made his fortune, and her eyes light up when he naively trusts her with the diamond haul on which his future plans depend. That the principal characters all end up on the same boat is more down to chance than anything approaching intention or design, and once they disembark, this collective self-centredness threatens to destroy the group almost as soon as it hits the jungle. It's argued on this disc by the good Tony Rayns that this is a further reflection of Buñuel's earlier communist affiliations, and this makes perfect sense, as individual self-interest threatens the safety and lives of people whose chances of survival would considerably increase if they put aside their personal agendas and worked together for the communal good. Such self-centred and initially unlikeable lead characters should by all rights prove a barrier to audience engagement and for some it doubtless will. Far and away the most sympathetic character here (as well as being the only one who conforms to expectations) is the sweetly innocent Maria, but her role is never more than a supporting one. And while it's not hard to sympathise with the good-natured Castin in spite of (or perhaps even because of) his relationship naivety, he's a little too quick to side with Chark when he hijacks the boat, and once his head wound goes bad and starts affecting his judgement, his actions become a source of increasing frustration and start to threaten the group's fragile cohesion and its chances of survival. Yet there's something about this motley crew and their sometimes despicable behaviour towards each other that proves oddly engaging from an early stage, resulting in characters you'll be groaning at the actions of one minute and quietly egging on the next, and once they hit the jungle you do find yourself rooting for their survival against increasingly unlikely odds. The most surprising thing about Death in the Garden, given who's in the director's chair, is that it's also a rollicking adventure tale, busy with incident, confrontation and action in the first half (when the revolt kicks off, it does so with a thrilling sense of scale) and developing into a gripping tale of survival, inter-personal conflicts and shifting identities in the second. It's here that I found myself really engaging and sympathising with the characters' plight, as their food runs out, rain pours down on them while they attempt to rest (the frequently sodden actors really earned their pay cheques here) and an exhausting day-long trek sees them circle back to the point at which they started. Even the intermittent surrealistic overtones always serve to further the plot, as when the snake that Chark has killed and skinned is devoured by ants, a startling image that can't help but recall a memorable sequence from Buñuel's notorious debut, Un Chien Andalou, but also painfully robs this starving and desperate group of this one small vestige of hope, strengthening our bond with them in process. Despite the fact that we're all likely to approach Death in the Garden for the first time knowing full well that it was directed by the acknowledged master of cinematic surrealism, to get the most out of the film it's worth putting aside any expectations created by his startling debut and his acclaimed later work. Embracing the theory that a character doesn't have to be likeable to be interesting and running with it with scant regard for audience empathy, the film often moves at a breathless lick, tells a complex and multi-stranded story without a whiff of confusion, infuses its narrative with revolutionary politics, and rarely follows an even remotely predictable path – few will be able to anticipate where the trek through the jungle eventually lands our mismatched group, and I could write an entire essay on its socio-political subtext. And it may be down to chance, José-André Lacour's source novel (which I've not read) or Buñuel's playful nature, but it's hard not to read intention in the decision to give the ruthless lead character a name that's just one letter away from ‘shark', the self-righteous priest one that is perilously close to ‘lizard', and the mercenary prostitute the name of a Muslim demon. A primarily commercial venture it may have been, but for a whole string of reasons it deserves to be discussed in the same respectful tones as the director's more widely seen and celebrated works. A generally excellent 1.66:1 1080p transfer really showcases Jorge Stahl Jr.'s Eastmancolor cinematography, with a sometimes warm hue taking nothing away from the otherwise naturalistic colour, well-balanced contrast and impressively crisp image and picture detail. That said, I'm guessing that more than one source was used for this restoration and that a problem with sections of the best materials forced a couple of small compromises. This is most visible when Chark and Djin first meet and bed down for the night and the sequences that immediately follow. The couple's initial encounter is crisply rendered, but softens just before a suggestive fade out, and when the police arrive to arrest Chark the next morning, the image sharpness feels more like that of a DVD transfer, while the sequence that follows of a boat pulling up to shore is pure high definition gold. But these are small blips in an otherwise excellent transfer, one free of dust and visible damage and whose film grain is light but natural. The Linear PCM 1.0 mono track has the expected age-related range restrictions, but is otherwise clear and clean of any damage or distracting fluff or crackle. There is a degree of visible post-dubbing, but that's par for the course for a film from this period with a multinational cast. The optional English subtitles kick on by default but can be disabled for you fluent French speakers. The always fascinating and endlessly knowledgeable Mr. Rayns provides a typically detailed and enthralling examination of the Death in the Garden and its place in Buñuel's film career. He discusses the actors, the characters, the socio-political subtext and the ambiguous ending, so save this one until after you've watched the film at least once. He regards this as the best of Buñuel's Franco-Mexican co-productions (no argument here) and points out early on that that the literal translation of the original title, La mort en ce jardin is actually Death in This Garden. A 2009 interview with actor Michel Piccoli, whose role as Father Lizzardi was the first of several collaborations with Buñuel. He recalls being first drawn to theatre and eventually to film, and discusses his work for Buñuel, Godard and Hitchcock, amongst others. He talks in some detail about working with Buñuel, initially claiming that he remembers very little about his work on Death in the Garden, but later doing a bit of an about-face when he says that he remembers everything about monsieur Buñuel. He has some interesting anecdotes about working with the man and clearly holds him in high regard, describing him as the most deeply honest and scrupulous filmmaker he has known. He intriguingly says of him at one point, "When anyone in film talks about monsieur Buñuel, it's like he's still alive. It's his most terrible prank... the greatest prank he pulled on us." The interview is presented here in its unedited form, complete with off-camera comments and the sort of instructions to the actor that anyone who has conducted a video interview should be familiar with. Acclaimed scholar on the films of Luis Buñuel and modern Spanish literature, Victor Fuentes, provides a fascinating breakdown of what makes Death in the Garden such an important film in Buñuel's enviable oeuvre. He recalls first becoming hooked on Buñuel's cinema after a screening of Viridiana, and how his book on the director's Mexican period led to him meeting and becoming friends with him. He makes the case for the second half of Death in the Garden as the point at which it becomes a true Buñuel film, and provides a persuasive reading of the final scenes, those ones I can't discuss without getting into spoiler territory. Another very worthwhile extra, but again one that should be watched after the film. Almost the entire story compressed into a pacey and spoiler-free one-and-a-half minutes. Also included with the release version will be a Booklet featuring a new essay by Philip Kemp and archival imagery, but this didn't reach us in time for this review. A real surprise this one, a work from Luis Buñuel's Mexican period that both scores as an adventure film and simultaneously kicks against many of the traits that have defined the genre, whilst also making its mark as a Buñuel film. Impressively handled and solidly performed, with interesting characters that it takes some time to bond with, it's a fine rediscovery from Masters of Cinema that fills me with hope that this won't be the last Buñuel film to make its way onto this label. Warmly recommended.